I have posted and responded to a number of topics, now I would like some input from fellow knee people. after traveling up and down the East Coast to Wash. D.C, Pittsburg, New York and Baltimore to see top University oriented orthopedists, i set on the Anderson Orthopedic Institute, outside Washington D.C. to do my 13th surgery on my rt. knee, and first revision. However now just about two weeks away from surgery with a pre op appointment with surgeon on Tuesday, I am re-researching statistics on outcomes and high failure rate of revision surgery, especially when after all possible tests the doc's don't know the cause of my horrible debilitating pain. They strongly lean towards infection frather than aseptic loosening. That being said i reall cannot deal with failure or ongoing or maybe increased pain. I have read that with athrodesis, although a painful post op recovery for several weeksa, most patients who do have successful fusion are pain free. After losing a few years and nearly my life due to pain and pain meds I am actually thinking of asking the surgeon if he finds no obvious cause for the pain, aseptic loosening, or deep bone infection that would not show with aspiration or sedimentary or bone scans, to go directly to athrodesis. I am afraid I may have a fight so to speak on my hands as I read that most orthopedic to guns, see athrodesis as a salvage procedure after failure, and these top guns do not like to admit failure. There is over a 12 to 15% failure mof revisions due to post operative infection, and loosening and instability is also a big problem, and frankly I want to be done with surgery and pain. I have actually put a splint on my leg and spent several day's getting around with a stiff knee, as it would be after fusion. It was no worse and rather easy to get around, although I would have to get a different car with bench seats, since my right leg would not bend under a drivers seat. I wonder if anyone has had an athrodesis, and especially before they tried revision. I have noted to others that if you really look at the orthopedic specialty literature, not the pop M.D. sits, but academic journals, that the failure rate for primary and revision authroplasty are no where as good as is stated by many hospitals and prothesis manufacturers. 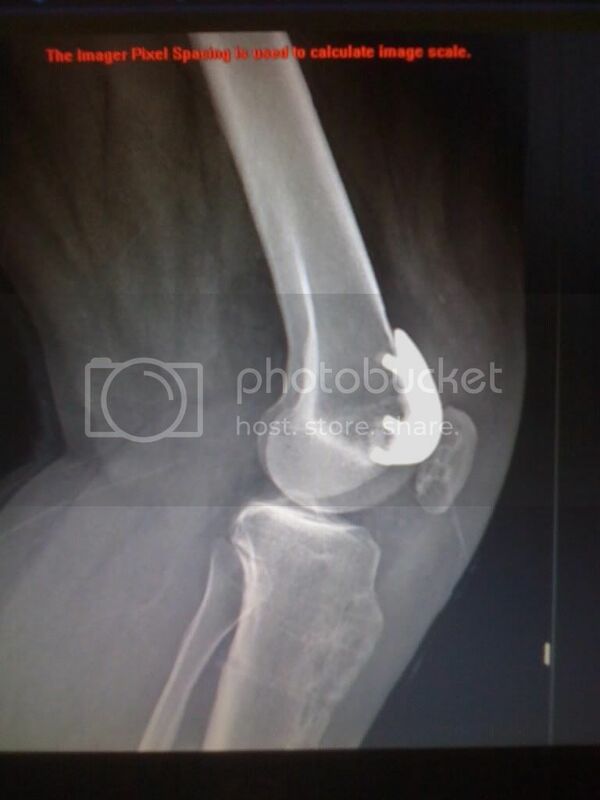 Knee replacement and revision surgery is a CASH COW, for hospitals and prosthetic manufacxturers, so if I could get some feedback from real patients that have been through either revision knee surgery oir athrodesis I might be better informed when I discuss the final options prior to the surgery scheduled for Jan. 25. I know the doctor's bias against giving up as they see athrodesis, but I have to look out for my future and do what is best to get my life back in my senior years. Thank you to anyone who offers feedback. By the way a few people said I should not use caps, frankly the reason I type with caps is so I can reread what I write and deal with typos. After the brain hemorrhage I suffered in late January last year I have had difficulty with eye sight, but I will try to keep the caps off even if there are more typos. Thanks and please, your thoughts to this suffering old musician. I am sorry you have had such a horrible experience. My heart goes out to you. While I don't have any direct personal experience with athrodesis we did have one poster I can remember who whet through the procedure after many failed TKR's. The poster was BEDA. You can use the search feature on the left to find her posts (If you have trouble let me know and I can help). Now here is my Warning before you read please know she had a very very very bad experience with the athrodesis. In the end things did not work out well and she opted for more drastic measures. Sorry I don't have any more specific information for you. Keep fighting...I know I would!! If anyone else has any ideas about revision vs. immediate athrodesis if my surgeon would consider it please let me know, as one thing is sure I don't think I can continue with the pain I have much longer. I can't add anything specifically as its outside of my experience or knowledge. I know I've seen people who have obviously had fusion of the knee getting about in towns and hospitals and Yes, they seem to manage pretty well. The one things I'd be curious is whether the athrodesis definitely removes the pain? I guess it must do, but it would be awful to go through it and still have post surgical pain, especially as they aren't clear on WHY you have such bad post TKR pain. Are there any statistics for pain after athrodesis? I know I've been recommended to have a big toe fusion as it is pretty badly degenerated but presently I manage it with no high heels and stuff, and its a much smaller joint than the knee. it is still a scary concept though, choosing to give up the motion of any joint and I empathise with your predicament. can't comment on the political aspects as I am UK based. Oh and a big thank you for the text switch. I hadn't realised you struggled with standard text, but its way easier to read for us and you do make some good points which I think were being missed. So, thank you. Thank you for your response. Actually while I have yet to speak with the orthopedic surgeon I chose, everything I have read is that aside from some pretty intense post op pain with athrodesis, which can be controlled for the first week or so in hospital with morphine pump, you are basically pain free. That does assume that the doc's get rid of an infection that may exist and that good fusion takes place, where according to literature it does about 90% of time. The stats say that a very high % of results of fused athrodesis does allow a pain free life. The two problems I have are with the doctor and some family and friends. I really think the doc is going to nix the concept of going to athrodesis as a first tier approach, even though I have off the scale chronic pain for at least 5 years. As I said the literature almost always refers to athrodesis as a "salvage surgery" simply allowing the patient to keep the leg and be pain free. The other issue I have is some family and friends seem to feel it is to radical to start with, while others agree with me that it is a reasonable choice. The way I see it and wil present to the surgeon this week when we meet for pre op appointment is that at 66 years old, I do not have a lot of years to try revision as it will take at least a year to fully recover from major surgery number 13 on knee and tell if I will be fairly pain free. Then at 67 I would need athrodesis and another four to six months to fusion and who knows what else. I do not want to be in my 70"s and weaker and have to face removal of another failed protheses and then athrodesis, ther is a limit to what the body can take. If the doctor finds something specific like ascptic loosening or definate infection that can be cured I would say go ahead and try to fix it. But if when he get's into the knee, ther is no sign of bone infection or aseptic loosening then it truly becomes an unknown chronic pain syndrome, and almost all the literature says the results of pain eradication when the cause is unknown is POOR for revision surgery. So I hope I can convince the doc that if he finds something blatently wrong go ahead and fix it and we will move on hopefully, but if he with a lot of direct and teaching experience finds nothing wrong go to athrodesis because then the odds go way down for the success of revision. As I said if anyone else has been in this delima please let me know, but it may be academic anyway if the doc totally refuses to go to athrodesis, even if everything looks good in the knee as he seems to want to try a clean replacement and revision regardless. One would like to think that since I am paying him the doctor would follow awhat I consider a reasonable patient request, but I think he will feel ethically since he is the DOCTOR, and knows more than I do he would refuse patient requests to do what he deems as radical surgery. I can academically understand if he takes that stance, and regardless after waiting as long as I have for this surgery date, I don't think I am ready to cancel, and start all over finding a top doc who will agree with me. I know if I look hard enough I will find a doc to do what I want, bnut then again I don't want a hack cutting me just to make a buck, so since I have spent nearly a year seeing doctors and deciding on the one I really trust I guess I have to follow his lead, so to some degree my mind is made up and all I can do is have a discussion with the doctor on Tuesday and hope he at least hears me out. I am still open to learning from a professional I trust but would also like to hear from anyone has been through what I am dealing with. Thanks. I am hoping that your appointment on Tuesday is a good one and that you are able to have a very frank discussion with the OS about your options and outcomes and how your pain will be dealt with. You need some good news! You've done your homework and have found an expert, so I'm betting he is going to find something that will help you. But I imagine it will be very good to have a discussion with him on Tuesday about arthrodesis and what kind of outcome you could expect from that. Hopefully he will be honest and open with you about what kind of outcome you could expect there. It's definitely something that gets talked about around here on occasion, but we don't usually see anyone who has had it done. Hopefully after you meet with your doc you can come back and inform us a little bit. I'm having an appointment Tuesday as well, so as I go, I'll be thinking about you and will say a little prayer that we both get some good answers! Hi was wondering if you had the fusion of your knee I'm 41 live in uk and am 11 weeks in to my fusion.